Communication technologies have revolutionized in a significant way. Landline phone is one of the oldest device that people use for communicating with each other. Landline phones connect you with your near and dear ones event if they are miles away from you. There are different types of Landline phones available in the market, broadly categorised into corded and cordless phones. These phones have made communication simple and cater to the various telecommunication needs of a diverse range of users. You can have a phone in your office, shop, home, or for any other commercial or non­commercial use. Landline phone is one of the important source of communication in corporate offices that connect different departments with each other. These days people are more inclined towards cordless phones as compared to the corded ones. These phones allow you to roam around and talk. You can talk over the cordless phone from any corner of your home. They have outstanding battery life and comes with an array of adjustable features like adding phonebook entries from the handset, modifying the ringer volume, silent mode, list of last numbers you dialed on the phone and more. 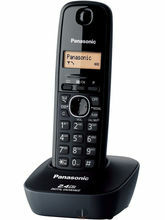 Cordless phones in today's world make use of Bluetooth functionality and get seamlessly paired with your cell phone. It allows you to make calls with your cellular connection instead of landline. These phones comes with outstanding battery life with 7 to 20 hours of talk time and 5 to 11 days of battery life on standby. Some cordless phone systems also enable you to add up to 12 handsets. Other advantageous feature of the phone is the loudspeaker, the base and handset both have speaker phones with clearer microphones resulting in better voice quality. While choosing a cordless phone, you should also consider additional device features that include Caller ID, Conferencing and Alarms. Conferencing allows multiple people to simultaneously speak to one another over a phone call and serves a significant purpose in the business world. You can set a wakeup call via Alaram and it is also incredibly helpful in the kitchen. Infibeam features a huge range of corded and cordless phones from the popular brands like Panasonic, Beetel, Orpat, Gigaset (Siemens) and more. You can find a large variety of best corded and cordless phones equipped with the latest technology. These phones are available at the best prices with great discounts. Browse for the phones online based on the telephone type, brand or price and buy today a suitable one for your home or office.